PTMSC is part of the Northwest Marine Mammal Stranding Network, which is overseen by the National Oceanic and Atmospheric Administration (NOAA). As a regional stranding network, PTMSC staff and volunteers respond to stranding reports, keep shoreline users at a safe distance, and collect data from dead animals. PTMSC covers the shoreline from Brinnon to Diamond Point, WA. The Northwest Marine Mammal Stranding Network program was formalized by 1992 Amendments to the Marine Mammal Protection Act. NOAA's National Marine Fisheries Service (NMFS) is the lead agency and coordinates related activities. Volunteer stranding networks exist in all coastal states and are authorized through Stranding Agreements from NMFS regional offices. How do I know if a marine mammal is stranded? This message line is checked several times a day. Messages left on other extensions may not be received the same day. Taking photographs of the animal is extremely helpful. You may be asked to email your photos to our staff. A stranding occurs in the wild and involves one or more marine mammals. A stranded marine mammal may be: dead onshore or floating in the water; alive but injured or unable to return the water; or alive but unable to return to its natural habitat without assistance. Any animal that appears injured, in distress or out of its natural habitat should be reported. When in doubt, please report the animal. Seals and sea lions come ashore for part of each day to rest, regulate their temperature and socialize. This is normal behavior. Keep 100 yards from marine mammals on shore if possible. Do not attempt to touch, harass or feed marine mammals. Port Townsend Marine Science Center - The Link to Action from Al Bergstein on Vimeo. 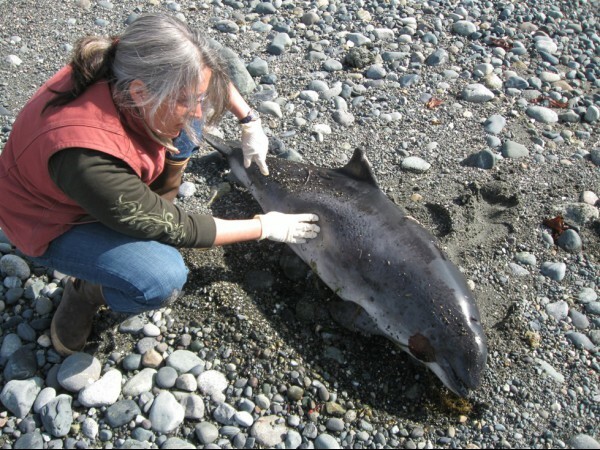 The 2002 stranding of a killer whale near Dungeness Spit attracted the attention of scientists nationwide and led to many new educational and community involvement projects at PTMSC.